In my head I have asked these cyclists so many unheard questions that I think I have come up with their unheard answer by myself. Q. Cyclist, how do you…? It’s as simple as that! I think! My observations seem to suggest that by acting as though they belong on the road as much as everybody else and simply moving along with confidence, a cyclist can convince the drivers of cars that this is a cyclist who knows what they are doing and where they are going. And has a right to be there. The cyclist’s body language often implies which direction they are about to move in and, along with the use of obvious and deliberate movements, this means a car driver can predict their next moves and give way appropriately. People only get grumpy when unexpected (particularly unexpectedly dangerous) things happen. 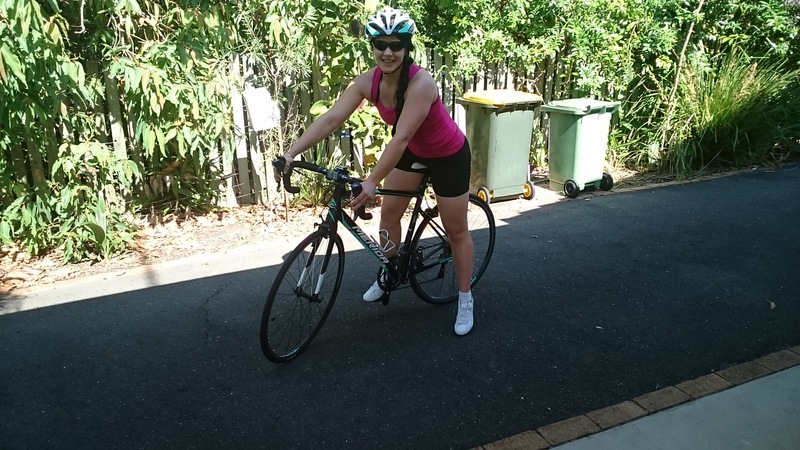 So it turns out that I may be a born cyclist after all – because the basic mantra I think I need to employ is ‘fake it til you make it’ which is actually the approach I have taken to most of my triathlon training. When I ride my bike, I will puff myself out to be a bigger presence on the road, and I will move with certainty. I will calmly take up an entire lane of a dual lane road when I want to go right around the roundabout, if that is the practical thing to do. Of course, I will always use the road safely as I would in a car, looking for safe gaps to move into and maintaining an awareness of the movements around me through careful looking and listening – don’t worry mum! For instance, I didn’t see any cyclists wearing headphones playing music, so clearly it is well accepted that you need to have all senses engaged when cycling. Not that I own any headphones yet anyway. So, with my detective work completed, I decided that I could indeed muster up the courage to cycle down to the gym on the road. Yes, the busy road. Yes, the dual lane road. Yes, going right around the roundabout. On Friday I woke up and the roads were bone dry – perfect. My new helmet glinted in the sun. I pumped up the skinny wheels of my Merida bike and slipped my feet into my clippy shoes. I told Shane to wait five minutes and then drive down to the gym in the car so that he could collect my body if I had splattered under the wheels of a stranger’s vehicular weapon. I set off. It was a real buzz to be riding on the busy road; I was excited. I have ridden my bike enough now that I don’t feel too bad going over the potholes and gravel; it no longer feels like I’m riding my washing machine while it is on the highest spin cycle. I had my beautiful helmet on, my beautiful shoes, and having only just set out I was whizzing along at 30km an hour with ease. I felt like a professional. Approaching the first intersection, where I am usually on the path, I began pulling on the brakes with about 100 metres to go. I usually drive through these same lights 2 or three times a day every day of my life, so I knew they were about to turn green. I didn’t unclip, but I was at the front of the queue of traffic by the time the light changed. I stood up out of my saddle and pushed off with all my might (up a slight incline) and was careful to stay as far left as possible. There were roadworks set up further along the incline so I thought cars would get stuck behind me, but they all overtook and I had plenty of room around me. No brushes with death. I heard a familiar rumble and Shane overtook me at this point. I hoped he was impressed with how pro I looked. After crossing a bridge over the motorway I came to a downhill, which doesn’t feel like much in the car but was fantastic on the bike; I was one with the wind. I stopped pedaling and glanced over my left shoulder to watch for cars coming down the slip road from the motorway. There were none, so as soon as I could I crossed the slip lane and snuggled in to the far left of what was now the dual lane road. My heart was beating like I’d had 4 shots of espresso. It was thrilling. As the hill flattened out I began to pedal steadily, carefully calculating how far there was to go to the roundabout. I looked over my right shoulder 4 or 5 times to see how quickly cars were overtaking me, to try to figure out how big a gap I would need in order to move into the right hand lane. Eventually the road started to snake into the entry of the roundabout… and I found the perfect gap, and moved with unflappable focus into the right hand lane, where I took centre stage. I stuck my hand out straight and strong to indicate that yes, I was in the right hand lane because I was going right. It was only the second time I had ever tried to signal, but I engaged all my muscles and held myself balanced and controlled, with success. I didn’t have to stop at the roundabout which was a blessing because I was able to maintain my speed. I leant into the turn of the roundabout and my trusty Merida steed followed my orders perfectly. Cars gave way to the pink flash in front of them, and I was gone. As soon as I entered the long driveway to the gym, I was full of ego and pride at my incredible success; I hadn’t been run over! I pumped my legs like I was fist-pumping at my favourite Greenday concert and bowed my head into an awesome aerodynamic position that made me feel like a lethal torpedo tearing the road in two. I arrived at the gym breathless, but so pleased I had quit the path to try the bitumen. Because I have a road bike, and I ride it on the road. This entry was posted in Show Me Bike and tagged bike, cycling, ego, newbie, road bike, training, triathlon. Bookmark the permalink. Thank you Grandpa, yes driving a car requires confidence too, so guess you are right, it is the same thing all over again. I am looking forward to being a road racer one day! Every word of this terrified me.